среда, 17 сентября 2008 г. The ongoing crisis in the Caucasus is intimately related to the strategic control over energy pipeline and transportation corridors. There is evidence that the Georgian attack on South Ossetia on August 7 was carefully planned. High level consultations were held with US and NATO officials in the months preceding the attacks. The attacks on South Ossetia were carried out one week after the completion of extensive US - Georgia war games (July 15-31st, 2008). They were also preceded by high level Summit meetings held under the auspices GUAM, a US-NATO sponsored regional military alliance. July 1-2, 2008 GUAM Summit in Batumi, Georgia. July 1, "US-GUAM Summit" on the sideline of the official GUAM venue. July 5 -12, Russian Defense Ministry hold War Games in the North Caucasus region under the codename "Caucasus Frontier 2008". July 15-31, The US and Georgia hold War Games under the codename Operation "Immediate Response". One thousand US servicemen participate in the military exercise. August 8, Russian Forces Intervene in South Ossetia. GUAM is a military agreement between Georgia, Ukraine, Azerbaijan and Moldova, first established in 1997. Since 2006, following the withdrawal of Uzbekistan, GUAM was renamed: The Organization for Democracy and Economic Development - GUAM. GUAM has little to do with "Democracy and Economic Development". It is a de facto appendage of NATO. It has been used by the US and the Atlantic Alliance to extend their zone of influence into the heartland of the former Soviet Union. The main thrust of GUAM as a military alliance is to "protect" the energy and transportation corridors, on behalf of the Anglo-American oil giants. GUAM countries are also the recipients of US-NATO military aid and training. The militarization of these corridors is a central feature of US-NATO planning. Georgia and Ukraine membership in NATO is part of the agenda of controlling the energy and transport corridors from the Caspian Sea basin to Western Europe. The July 1-2, 2008 GUAM Summit Batumi meetings, under the chairmanship of President Saakashvili, focused on the central issue of pipeline and transportation corridors. The theme of the Summit was a "GUAM – Integrating Europe’s East”, from an economic and strategic-military standpoint, essentially with a view to isolating Russia. The presidents of Azerbaijan, Georgia and the Ukraine (respectively Ilham Aliyev, Mikheil Saakashvili and Viktor Yushchenko) were in attendance together with the presidents of Poland, Lech Kaczynski, and Lithuania, Valdas Adamkus. Moldova's head of State flatly refused to attend this summit. The GUAM Summit agenda focused on undermining Moscow's influence in the Caucasus and Eastern Europe. The Polish President was in attendance. Barely acknowledged by the media, a so-called "US-GUAM Summit" meeting was also held on July 1st on the sidelines of the official GUAM summit venue. US Deputy Assistant Secretary of State David Merkel met both GUAM and non-GUAM delegations behind closed doors. Several bilateral meetings were held including a Poland GUAM meeting (during which the issue of the US missile defense shield on Polish territory was most probably addressed). Private meetings were also held on July 1st and 2nd at the residence of the Georgian President. One thousand U.S and six hundred Georgian troops began a military training exercise under Operation "Immediate Response". US troops included the participation of the US Air Force, Army, Marines and National Guard. While an Iraq war scenario had been envisaged, the military exercises were a dress rehearsal for an upcoming military operation. The war games were completed on July 31st, a week before the onset of the August 7th Georgian attacks on South Ossetia. Troops from Ukraine and Azerbaijan, which are members of GUAM also participated in Operation "Immediate Response" Unexpectedly, Armenia which is an ally of Russia and a staunch opponent of Azerbaijan also took part in these games, which also served to create and "train and work together" environment between Azeri and Armenian forces (ultimately directed against Russia). The Russian war games were explicitly carried out in response to the evolving security situation in Abhkazia and South Ossetia. The exercise, dubbed "Caucasus Frontier 2008", involved units of the 58th Army and the 4th Air Force Army, stationed in the North Caucasus Military District. These units of the North Caucasian Military District (Army and Air Force) were subsequently used to lead the Russian counterattack directed against Georgian Forces in South Ossetia on August 8th. A central issue on the GUAM-NATO drawing board at the July GUAM Summit in Batumi, was the Odessa-Brody-Plotsk (Plock on the Vistula) pipeline route (OBP) (see Maps 3 and 4), which brings Central Asian oil via Odessa, to Northern Europe, bypassing Russian territory. An extension of OBP to Poland's port of Gdansk on the Baltic sea is also envisaged. It should be noted that the OBP also links up with Russia's Friendship Pipeline (Druzhba pipeline) in an agreement with Russia. Washington's objective is ultimately to weaken and destabilize Russia's pipeline network --including the Friendship Pipeline and the Baltic Pipeline System (BPS)-- and its various corridor links into the Western Europe energy market. The Baltic Pipeline System (BPS) also operated by Russia's Transneft links Samara to Russia's oil tanker terminal at Primorsk in the Gulf of Finland. (See map below) It carries crude oil from Russia's Western Siberian region to both North and Western European markets. 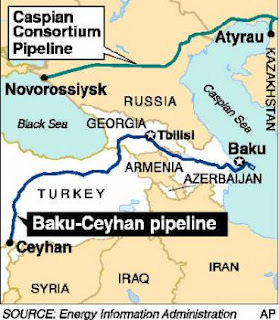 Another strategic pipeline system, largely controlled by Russia, is the Caspian Pipeline Consortium (CPC). The CPC is a joint venture arrangement between Russia and Kazakhstan, with shareholder participation from a number of Middle East oil companies. The Baltic Pipeline System (BPS) is tied into the Atyrau-Samara (AS) pipeline, which is a joint venture between Russia's Transneft and Kazakhstan's national pipeline operator, KazTransOil. The AS pipeline in turn links up with the Russia-Kazakhstan Caspian Petroleum Consortium (CPC), which pumps Tengiz crude oil from Atyrau (Western Kazakhstan) to the CPC’s Russian tanker terminal near Novorossiysk on the Black Sea. On July 10, 2008, barely a week following the GUAM Summit, Transneft and KazTransOil announced that they were in talks to expand the capacity of the Atyrau-Samara pipeline from 16 to 26 million tons of oil per year. (RBC Daily, July 10, 2008). The GUAM governments represented at the Batumi GUAM Summit also approved the further development of The GUAM Transportation Corridor (GTC), which complements the controversial Baku Tblisi Ceyhan (BTC) pipeline. The latter links the Caspian Sea basin to the Eastern Mediterranean, via Georgia and Turkey, totally bypassing Russian territory. The BTC pipeline is controlled by a oil consortium led by British Petroleum. Both the GTC and the BTC corridors are protected militarily by GUAM and NATO. The GTC corridor would connect the Azeri capital of Baku on the Caspian sea to the Georgian ports of Poti/ Batumi on the Black Sea, which would then link up with the Ukrainian Black sea port of Odessa. (And From Odessa, through maritime and land routes to Western and Northern Europe). Israel is now part of the Anglo-American military axis, which serves the interests of the Western oil giants in the Middle East and Central Asia. Not surprisingly, Israel has military cooperation agreements with Georgia and Azerbaijan. While the official reports state that the BTC pipeline will "channel oil to Western markets", what is rarely acknowledged is that part of the oil from the Caspian sea would be directly channeled towards Israel. 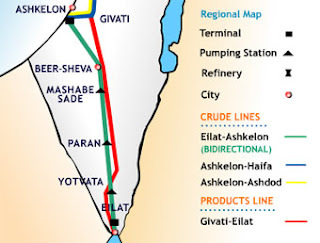 In this regard, an underwater Israeli-Turkish pipeline project has been envisaged which would link Ceyhan to the Israeli port of Ashkelon and from there through Israel's main pipeline system, to the Red Sea. The objective of Israel is not only to acquire Caspian sea oil for its own consumption needs but also to play a key role in re-exporting Caspian sea oil back to the Asian markets through the Red Sea port of Eilat. The strategic implications of this re-routing of Caspian sea oil are farreaching. The Silk Road Strategy (SRS) constitutes an essential building block of US foreign policy in the post-Cold War era. The SRS was formulated as a bill presented to the US Congress in 1999. It called for the creation of an energy and transport corridor network linking Western Europe to Central Asia and eventually to the Far East. The Silk Road Strategy is defined as a "trans-Eurasian security system". The SRS calls for the "militarization of the Eurasian corridor" as an integral part of the "Great Game". The stated objective, as formulated under the proposed March 1999 Silk Road Strategy Act, is to develop America's business empire along an extensive geographical corridor. While the 1999 SRS legislation (HR 3196) was adopted by the House of Representatives, it never became law. Under the Bush administration, the Silk Road Strategy became the basis of US-NATO interventionism, largely with a view to integrating the former Soviet republics of the South Caucasus and Central Asia into the US sphere of influence. The successful implementation of the SRS required the concurrent "militarization" of the entire Eurasian corridor from the Eastern Mediterranean to China's Western frontier bordering onto Afghanistan, as a means to securing control over extensive oil and gas reserves, as well as "protecting" pipeline routes and trading corridors. 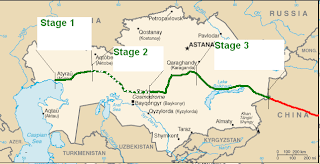 The invasion of Afghanistan in October 2001 supported American strategic objectives in Central Asia including the control of pipeline corridors. Afghanistan is also a strategic landbridge linking the extensive oil wealth of the Caspian Sea basin to the Arabian Sea. "The development of strong political, economic, and security ties among countries of the South Caucasus and Central Asia and the West [which] will foster stability in this region, which is vulnerable to political and economic pressures from the south, north, and east. [meaning Russia to the North, Iraq, Iran and the Middle East to the South and China to the East] (106th Congress, Silk Road Strategy Act of 1999)The adoption of a neoliberal policy agenda under advice from the IMF and the World Bank is an integral part of the SRS, which seeks to foster "open market economies... [which] will provide positive incentives for international private investment, increased trade, and other forms of commercial interactions". (Ibid). The SRS is also intent upon preventing the former Soviet republics from developing their own economic, political and military cooperation ties as well as establishing broad ties up with China, Russia and Iran. (See Michel Chossudovsky, America's "War on Terrorism", Global Research, Montreal, 2005). In this regard, the formation of GUAM, which was launched in 1997, was intended to integrate the former Soviet republics into military cooperation arrangements with the US and NATO, which would prevent them from reestablishing their ties with the Russian Federation. Under the 1999 SRS Act, the term "countries of the South Caucasus and Central Asia" means Armenia, Azerbaijan, Georgia, Kazakhstan, Kyrgyzstan, Tajikistan, Turkmenistan, and Uzbekistan. (106th Congress, Silk Road Strategy Act of 1999). The US strategy has, in this regard, not met its stated objective: Whereas Ukraine, Azerbaijan and Georgia have become de facto US protectorates, Kyrgyzstan, Kazakhstan, Tajikistan, Armenia and Belarus are, from a geopolitical standpoint, aligned with Moscow. "In the Caspian-Black Sea Region, the European Union and the United States have concentrated on setting up a reliable logistics chain to connect Central Asia with the European Union via the Central Caucasus and Turkey/Ukraine. The routes form the centerpiece of INOGATE (an integrated communication system along the routes taking hydrocarbon resources to Europe) and TRACECA (the multi-channel Europe-Caucasus-Asia corridor) projects. Barely a few days following the GUAM Summit in Batumi, China and Kazakhstan announced (July 9, 2008) the commencement of construction work of a 1,300-kilometer natural gas pipeline. The inaugural ceremony was held near Kazakhstan's capital Almaty. China’s National Petroleum Corporation (CNPC) which is the leading operator of the consortium, "has signed deals with state oil and gas firms of Turkmenistan, Uzbekistan and Kazakhstan giving them 50 percent stakes in their respective parts of the pipeline." The KPC pipeline project encroaches upon US strategic interests in Eurasia. It undermines the logic of America's Silk Road Strategy. The KPC is part of a competing Eurasian based transportation and energy strategy, largely dominated by Russia, Iran and China. The SCO is a military alliance between Russia and China and several Central Asian former Soviet republics including Kazakhstan, Kyrgyzstan, Tajikistan and Uzbekistan. Iran has observer status in the SCO. The Collective Security Treaty Organization (CSTO), which plays a key geopolitical role in relation to transport and energy corridors, operates in close liaison with the SCO. The CSTO regroups the following member states: Armenia, Belarus, Kazakhstan, Kyrgyzstan, Russia, Tajikistan and Uzbekistan. Of significance, since 2006, the SCO and the CSTO member countries have conducted joint war games and are actively collaborating with Iran. While remaining distinct from an organizational standpoint, in practice, these two regional military alliances (SCO and SSTO) constitute a single military block, which confronts US-NATO expansionism in Central Asia and the Caucasus. The US-NATO protected SRS Eurasian transport and energy corridors, are slated to link Central Asia to the Far East, as outlined in the Silk Road Strategy. At present, the Eastward corridors linking Central Asia to China are protected militarily by the SCO-CSTO. In terms of Washington's global military and strategic agenda, the Eurasian corridors contemplated under the SRS would inevitably encroach upon China's territorial sovereignty.The proposed US-NATO-GUAM pipeline and transportation corridors are intended to connect, at some future date, with the proposed transport and energy corridors in the Western hemisphere, including those envisaged under the North American Security Prosperity Partnership (SPP). The Security Prosperity Partnership (SPP) is to North America what the Silk Road Strategy (SRS) is to the Caucasus and Central Asia. They are strategic regional constructs of America's business empire. They are the building blocks of the New World Order. The SPP is the result of a similar process of strategic planning, militarization and free market economic integration, largely based on the control of strategic resources including energy and water, as well as the " protection" of energy and transportation corridors (land and maritime routes ) from Alaska and Canada's Arctic to Central America and the Caribbean basin. Author's Note: This article has focused selectively on key pipeline corridors with a view to analyzing broad geopolitical and strategic issues. An examination of the overall network of Eurasian pipeline corridors would require a far more detailed and comprehensive presentation. THE CAUCASUS APPETITES OF THE "TRUE ALLY"